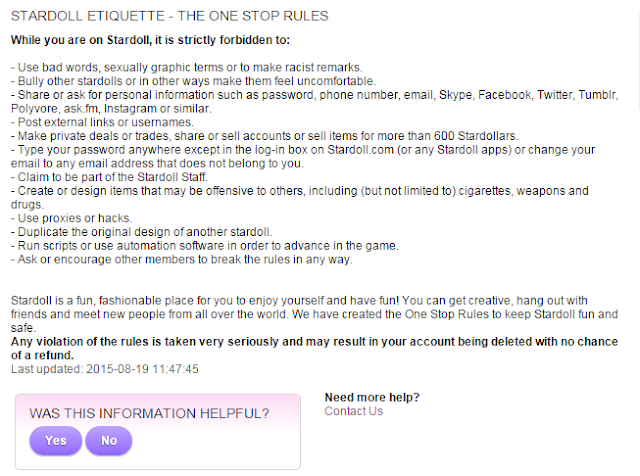 Stardoll has made an update on its rules. So, everyone encouraging or asking other users to break the rules in any way, can be deleted from Stardoll with no chance of refund. This means that if you ask someone else to break any of these rules, for example, ask someone else to trade anything with you, ask someone else to buy a starcoin item for stardollars or for more than 600 sc/600 sd, making private deals, asking for a cloned wig to a user that is copying other users designs, or anything else against the rules, you are also breaking the rules and can be deleted by Stardoll. So please guys, read the rules, and follow them to don't get in trouble! !